If you’re familiar with the way things work in the garbage disposal unit industry, you would know how the best models are born. If you have tried or tested different disposers, you would have already learned how to distinguish the good ones from the bad. You would know that a high quality unit will offer you durability, strength, speed, and affordability above all. Some units go beyond simply giving you a strong and powerful service; there are some that strive to give you more value for your money. The Waste Maid US-WM 658 stands out from the crowd by giving you more benefits than you can wish for. So how does one simple disposer stand out from the crowd? When faced with the best of the best models, how can we choose which one to take home? Well, some disposers opt to bombard their targeted homeowners with an array of useful features. The better the features, the more likely it is to be chosen. This is the only way for manufacturers to ensure that their product becomes a hit. 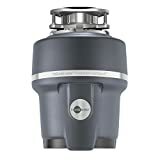 A great example of this would be the Waste Maid Garbage Disposal US-WM 658 Premium 1-1/4 HP. By reading this guide, you will learn how it manages to take one step ahead of the competition. Let’s begin by saying that this Waste Maid Garbage Disposal possesses one of the highest possible levels of power that one unit can have. It is run by a 1-1/4 HP permanent magnet motor, meaning it is a really great grinding tool, if not one of the best. If you want a disposer that you can use regularly, this is a good choice because it can shred food waste that weaker models cannot. Additionally, the grinding chamber is corrosion-proof, meaning it can stand the test of time because it is far more durable than other units. But what truly shines for this incredible disposer is the list of features that come loaded within its high-powered machine. First in line is the so-called Bio-Shield anti-microbial agent, which does exactly what it sounds like. It protects the inner workings of the Waste Maid unit from the growth of harmful bacteria, thereby stopping its accumulation and preventing odor from forming beneath your sink. Nothing can ruin an appetite and a kitchen’s clean atmosphere better than the smell of rotting food waste. Waste Maid US-WM-658 also comes with a removable splash guard that lets you clean it on the inside once the unit is turned off. This further ensures your disposer’s cleanliness. Meanwhile, the speed master mounting system allows for a fast and easy installation that you can figure out yourself, even when you have no prior experience. Other impressive components within this model include the laser-sharp cutting ring; the balanced turntable, armature and impellers; and the stainless steel swivel impellers. A few reviewers however complained that the instructions can be a bit confusing, especially for beginners. With some assistance, the installation process shouldn’t be a burden at all.